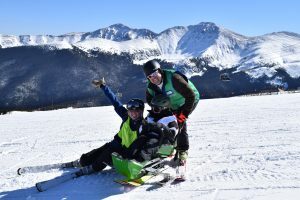 Ski and snowboard instructors work with students who have a range of cognitive and/or physical disabilities. Ski and snowboard instructors spend their days on the slopes creating lifelong memories with participants. We train you to work with adaptive students and equipment. Training begins in October and continues through December. Volunteers start working with participants in January and lessons continue until early April. Schedule: The average volunteer day is from 8:30 a.m. – 4:00 p.m. Programs operate 7 days a week. We have 5-week programs that begin the first weekend in January and run for 5-weeks at a time throughout the winter season. In addition, we have custom groups that are scheduled on varying dates and durations. Typically a volunteer picks the same day each week to volunteer throughout the season or can volunteer on flexible days with Custom Groups. Lunch is usually spent with the student and/or group. Bronze Volunteers are also known as Assistants to the Instructors, as their primary purpose is to ASSIST other Staff and Volunteer Instructors with lessons. Bronze Volunteers commit to 1 full day of training and 2 full days of volunteering (lift pass provided). For every 2 full days of volunteering, a Bronze Volunteer will receive 1 day of free skiing at Winter Park Resort. Silver Volunteers are fully trained NSCD volunteer instructors that commit to 5+ instructing days per season. New volunteers to the winter program are required to complete 4 on-mountain training sessions their first season and a total of 5-6 within a calendar year. Returning volunteers are only required to complete 1 refresher training. Silver Volunteers will receive a limited lift pass to Winter Park Resort, which will cover all training and teaching days, plus 5 free days. Gold Volunteers are also trained NSCD Instructors, though they commit to 10+ instructing days per season. Gold level volunteers will receive an unlimited Winter Park Resort Season Pass. Training for volunteers is the same as a Silver Volunteer. Platinum Volunteers have already volunteered with the NSCD at the gold level for 15+ consecutive years, and have earned a lifetime pass to Winter Park Resort. These instructors commit to 1 day of training and a pre-determined number of volunteer days. Volunteers may sign up for more days than their commitment level requires. Please note: If you have previously been a ski/snowboard volunteer with the NSCD, please fill out the RETURNING Volunteer Application, even if you did not volunteer with our ski/snowboard program in the past year.